The Joshua House Federally Qualified Health Center is a new facility that will be operated by the Los Angeles Christian Health Centers (LACHC) and housed in the first three stories of a seven-story mixed-use project focused on providing affordable housing to low-income and underrepresented community members. LACHC provides medical services for homeless and low-income persons in Los Angeles’ Skid Row and currently operates two full-time clinics, 11 part-time satellite sites, and a street medical outreach team. 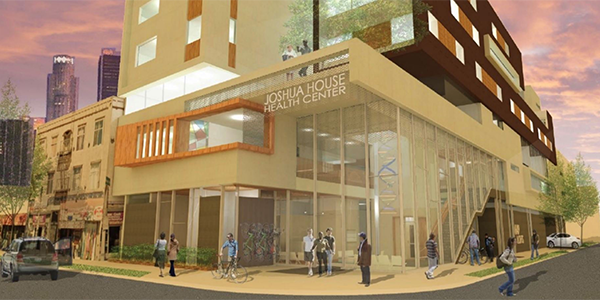 The new Joshua House facility will allow LACHC to increase the number of patients it serves from 3,227 to an estimated 7,000 individuals per year, and increase the annual visits from 19,240 to 48,726. The new facility will continue to target homeless individuals living in the Skid Row area of downtown Los Angeles, which is an area that suffers from significant gaps in access to health services for the chronically homeless population in the neighborhood. With 42.4% of the residents in this service area below the poverty level, the new health center will expand LACHC’s ability to care for the most vulnerable. The new Joshua House FQHC will have 24 medical examination and consultation rooms, 8 dental chairs, 9 mental health examination rooms, 13 social work offices, a health education and fitness area, a foot care program, and a meditation room. Construction of the 26,000 square foot health care facility is expected to begin in January 2018 and be completed in August 2019.